‘I kind of played the hyper-boy, and I had the opportunities to do that. For example, my dad, who I love to bits in all sorts of ways, bless him, is and was obsessed with motorbikes…and I got to ride, I got to race motorbikes at the age of seven. It was great! In so many ways, it’s fantastic. It’s quite an exhilarating experience. But there was a whole lot of, I think I was probably more aggressive, more committed, more determined to show what a normal little boy I was in the way that I embraced that… I was so scared that people would see that I didn’t really want to be a boy, that I played up the boy. And that’s something which really stayed with me right through my teens, and I have to say, it became a prison for so many years. Rachel was a practising Christian as a child, belonging to the Church of England, and prayed every night – the prayers always included that she would wake up the next morning as a girl. As a teenager, Rachel came to believe that God did not exist and she became vocally atheist. She went to study philosophy at university, and later taught in that subject. She had come to recognise herself as trans, but felt unable to come out or begin the transition process for fear of hurting those close to her. But in her early 20s, she realised that she could not continue living un-authentically, and decided to transition. It was after the process of transition that Rachel came back to religion. She found, in her mid-20s, that she felt the urge to pray. She started to attend an evangelical church in Lancaster, and began to feel called to ordained ministry. She understood that the church is an unjust institution in its treatment of LGBT people, and is committed to challenging and changing that. Rachel’s primary sexual desire was oriented towards women, and that didn’t work in the context of that church. Something she will never forget was one Sunday evening, she turned up at church on her own, having been attending for nearly a year. It was just before the 1997 general election. A man got up to preach, and talked about what Christians should vote for – they should not vote for the Labour Party because they were too liberal on matters of sexuality, and that to be gay was a fundamental sin. At that point she knew that the church is an unjust organisation, and that LGBTQI people are second class at best within the church, at the same time as feeling called to ministry. 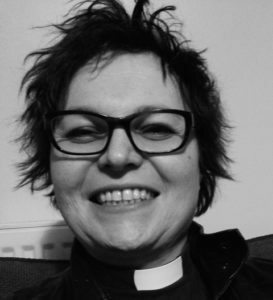 Rachel feels first and foremost called to be a parish priest and serve her local community. A typical day includes praying – for herself, others and the world – and to ensure she is available for others ‘to bind up their wounds’. She spends a lot of time looking after buildings, which takes too much of her energy. She does a lot of work with the creative arts in Manchester. She is quite high-profile as an out trans religious person, and spends time advocating on behalf of and supporting people who are coming to terms with their religion or trans identity, or both. She tries to make the church feel like home for trans people, and other groups who feel marginalised in a largely white, older congregation. At a queer history event recently, Rachel was reading and talking, and she was challenged by a young trans man about archives and the importance of trans people generating an archive that becomes a resource for others. Her initial reaction was that she was not overly concerned about it, but on reflection she came to feel that it really matters. Gender-nonconforming and trans people have always been around, but their history has been erased. She herself spent much of her life choosing erasure over being public and present. The notions of stealth, invisibility and ‘passing’ form a dominant narrative amongst trans people. By not being silent, trans people can change the dynamic of oppression – oral history does matter. This is a dangerous world in which to be trans. Project like Twilight People remind us that one can be authentically trans and also a person of faith. A public statement is a challenge to the church, and a work of restitution. Rachel has a tattoo on her arm in Latin, translating as ‘know yourself’, which is something fundamental to her religion and trans identity. It is a reminder to know herself in whatever situation she finds herself in. She wrote a book called Dazzling Darkness a few years ago in which she definitively came out, and her media profile increased. She has been invited to all sorts of things, including being invited to go on Big Brother. As a high-profile trans lesbian Christian, Rachel advocates on these issues and supports others. She continues to write poetry, and she speaks publicly on trans issues. Her guiding motto is ‘know yourself’.